This tunnel, referred to in early N&W documents as “Tunnel 377”, was first known as the Coaldale tunnel, but is now officially (as the sign on the lintel says) the Elkhorn tunnel. Shown is the SE portal at 37.333022, -81.338904, about one mile as the crow flies, from the NW portal of the Coopers tunnel, across the Bluestone River. The tunnel is on the Flat Top Extension, which opened up a way to the Ohio River for the N&W. It was excavated between 1887-1888 and is 1.3 miles long. As you can tell by the comment below, this posting is pretty much just twaddle. This is the Elkhorn Tunnel, but it’s Elkhorn Tunnel #2. The original tunnel was a single-track jobbie about 3,100′ long. That line was electrified between about 1915 to just after WWII. 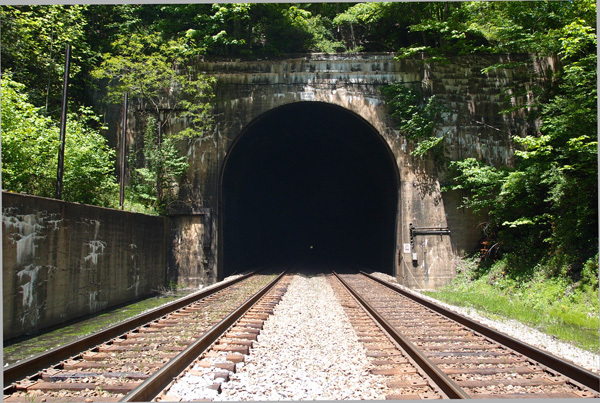 Wanting double tracks and seeing needs shift, N&W bored this tunnel, about 1.5 miles NW from Bramwell WV. It was dedicated in 1950. According to Buddy French (http://shinbrierwv.com/coaldale/return_to_coaldale_-_great_story_by_buddy_french), the old Elkhorn Tunnel, located at Coaldale, was abandoned and filled in after the new line was built. I always appreciate comments and corrections, always! Enjoying your blog, noticed this photo of the new Elkhorn tunnel. New Elkhorn tunnel replaced the single track old Coaldale tunnel which is close by to the north and slightly higher. Portals for that tunnel were buried. New Elkhorn was finished about 1950 and is 7101 feet in length. It originally had ventilating fans for blowing out the smoke from steam locomotives. These guys knew how to bore a tunnel! Not saying your wrong, but the Coaldale Tunnel was above this and to the right coming from Coopers Tunnel. It was deliberately filled in after Elkhorn was built. Don’t remember reading they gave this tunnel same name, but possibly. Just keep in mind this tunnel replaced Coaldale. Had the pleasure of walking through this. Doesn’t look like 7,000 ft, but it sure feels like it. Your memories are more valuable for me than the research I’ve done. I need now to go back and find out where I got the posting wrong. Many thanks! According to the Bluefield Daily Telegraph archives dating back as the 1890’s, construction began in 1886 on what was originally referred to as the Flat-top and or Elkhorn Tunnel. It seems to have taken on the Coaldale name in later years, most likely being associated with the Coaldale community located at the western entrance of the tunnel. In 1950 when the new Elkhorn Tunnel was opened, the Coaldale Tunnel was taken out of service. The Coaldale tunnel had been driven through the twelve thick Pocahontas No. 3 coal seam between the Mill Creek Coal & Coke Company lease and the Caswell Creek Coal & Coke Company lease. The N&W sold the coal as they advanced the tunnel which helped to offset its construction cost and it was completed in 1888. There were smaller parallel ventilation tunnels that were bored parallel with the main tunnel. There was also a tunnel length long barrier block of coal on each side of the railroad tunnel to protect it from the workings of the two adjacent mines. After the Coaldale tunnel was taken out of service in 1950, a coal company began mining the coal on each side of the railroad tunnel. According to the actual maps I have a copy of, mining began at the eastern entrance on 3-14-1952. The map shows progressive dates all the way through the mountain until the last coal was mined at the western entrance on 9-28-1955. As the supporting blocks of coal on each side of the railroad tunnel were mined out, the tunnel collapsed and doesn’t exist today. Absolutely fascinating information! Thank you! Thank you! But, within the confines of WordPress, there’s not reasonable way I can post all that. Please be more specific. Where near Carbo? Thank you! That helps a lot. Nothing like a new tunnel! That’s the old Sandy Ridge tunnel (there are two Sandy Ridge tunnels) at 37.037311, -82.189956. I’ve posted it at https://wordpress.com/post/thetunneldiaries.com/282. It wasn’t used for very long. Many thanks for the heads up on this!